For a limited time, receive the new firearm “the first time nature calls”. Scum recently became Devolver Digital’s biggest launch to date—on its first day of Early Access, no less. There’s little surprise at today’s announcement, then, that the game has sold over one million units. 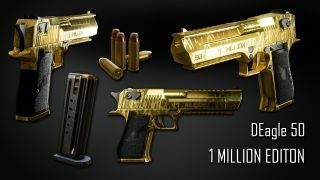 To celebrate, every player will receive a golden DEagle .50 “the first time nature calls.” This is a limited time deal though—you’ll have until September 25 to claim your shiny, new handgun. Additionally, players that have purchased the Support Pack will also receive a watch, imaginatively called a “Nice Watch.” While It doesn’t do much at the moment, future updates will see “more useful features” added. You can check out the details, as well as the most recent patch notes, here. For more intellectual Scum reading, our Chris celebrated National Video Games Day with this gallery of players pooping off the dam.